Before you attempt to refinish wood beds, you should consider a pair of critical points. 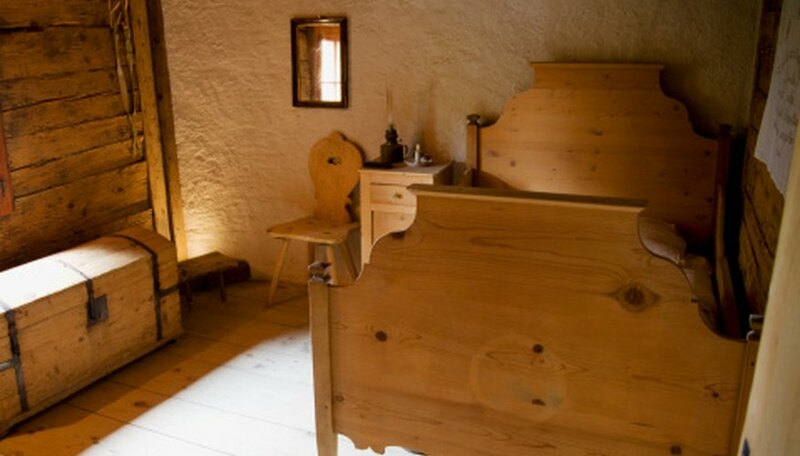 Wooden beds are coated with a protective layer of varnish that provides protection from abrasion scars. You must remove this glossy coating before you begin the application process. In addition, because stain is thin, it is prone to drips and splatters. Know how to use the appropriate materials to protect surrounding surfaces, or you could end up with permanent stains. Remove the mattress and bedding. Use ordinary dish soap and rags to clean the wood beds. Rinse the wood with damp rags. Wait a full day for the bed to dry. Sand the wood bed with a palm sander, equipped with 120-grit sandpaper. Sand along with the wood grain until the finish appears dull. Sand the wood bed, again, with a palm sander, equipped with 220-grit sandpaper. Sand along with the wood grain until the finish feels smooth. Eliminate sawdust from the wood bed by wiping it with tack cloths. Apply professional painter's tape to portions of the wood bed you do not want refinished. Place plastic drop cloths on the floor. Cover the plastic with fabric drop cloths. Place the wood bed on top of the drop cloths. Coat the wood bed with oil-based stain, using a paintbrush, engineered for use with oil paints. Wipe excess stain from the bed, using clean cloth rags. Wait 4 hours for the stained bed to dry. Wash stain from the brush with mineral spirits. Coat the stained wood bed with varnish, using the clean brush. Wait 6 hours before replacing the mattress and bedding. You may be unable to access tight, intricate areas of the bed, using the palm sander. In this case, fold single strips of sandpaper into smaller pieces and use them to access these awkward areas. You may also use scissors to trim the sandpaper into smaller pieces if necessary. You must sand off the existing layer of varnish from the wood bed before you stain, or you will have problems with absorption. Always sand along with the bed's wood grain, or you may cause splintering. Don't use plastic drop cloths alone, or stain drips will pool. Don't use fabric drop cloths alone, or stain drips may soak through.